Ryan has two things about which he seems somewhat passionate. The first is that he gives talks now and then about his essential philosophy of life, which is that attachments are unnecessary. This means attachments with both things and people. Ryan’s life is entirely his own. He’s a virtual stranger to his family, for instance, and spends perhaps a total of five or six weeks at his apartment in Omaha every year. The second is accruing 10 million frequent flyer miles on American Airlines. Doing so would make him only the seventh person to achieve this milestone and the youngest person to do it. Two changes hit Ryan’s life at virtually the same moment. The first is Alex (Vera Farmiga), who books about 60,000 flight miles per year. The two are immediately attracted to each other, and start to compare their schedules for when they might be in the same place at the same time for a series of hook-ups. The second change comes when he is called back to the home office in Omaha by his boss (Jason Bateman). There’s a new hire in the office named Natalie Keener (Anna Kendrick) who has determined that the current way of doing things is inefficient. Much of their work firing people could be more easily handled over video conferencing. This hits Ryan where he lives. First, it means that he may have to stop travelling. Second, it hits him in terms of the psychology of the position. It removes the human element and whatever empathy is possible in releasing people from their jobs. And so, Ryan is sent on the road with Natalie to show her the ropes of the job and introduce her to the reality of firing people for a living. Ryan is additionally tasked with taking photographs of a cutout of his sister (Melanie Lynskey) and her fiancé (Danny McBride) at various places around the country before her wedding. Eventually, he’ll have to go to that wedding, taking Alex as his “plus one.” This, along with conversations with Natalie about his own philosophy causes a sort of slow-brewing change in the way that Ryan may be thinking about the world and about the way he moves through it. Up in the Air is a movie about the performances. While Jason Reitman was nominated for Best Director for this, it’s the sort of movie where the directorial performance is best defined as the director simply stepping out of the way of what is happening on the screen. Small roles are handled by a quality line up, including bit parts from J.K. Simmons, Zach Galifianakis, Sam Elliott, Amy Morton, and Tamala Jones. 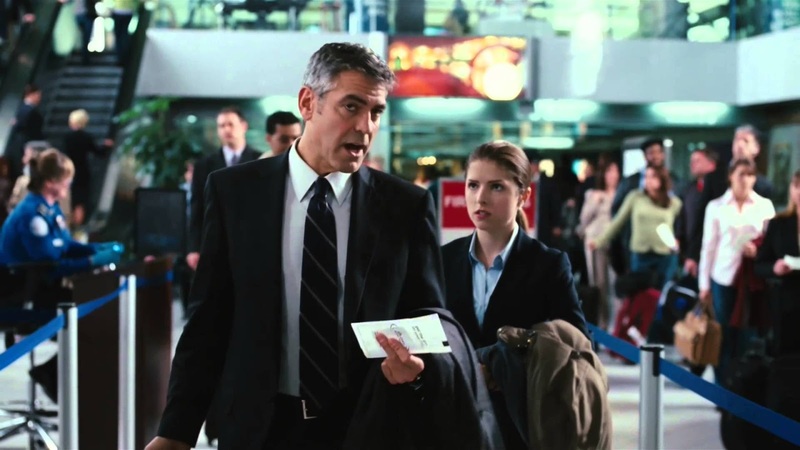 It’s the three main performances—Clooney, Farmiga, and Kendrick—that make the film what it is. The typical knock against George Clooney is that he typically only plays George Clooney in various guises. That’s kind of true here, at least in a sense. My guess is that Clooney isn’t as emotionally removed from the world as is Ryan Bingham. The challenge for Clooney here is to make Ryan Bingham someone real despite his extreme philosophy and way of living. This is a character that would be difficult to make real, but it works well. There is a very odd sense to him, a sort of emotional greyness that casts an appropriate shadow over the entire film. It’s a philosophy that is maintained at least in part by Farmiga’s Alex, who, by the end of the film, demonstrates an even more extreme and compartmentalized version of this philosophy. What works is that the ultimate philosophy of the character is one that would be determined as decidedly male in this context. Farmiga makes it work with a cold efficiency. It is Anna Kendrick’s Natalie who is in many ways the emotional heart of the film. She is the one character who seems to put forward a much more traditional system of beliefs, wants, and desires. She is tasked with portraying someone who desperately wants a particular kind of success not simply because of a desire to succeed professionally, but in life. Typically, it would be her at the center of the narrative, not the person who wants both career and family railing at the others. Up in the Air is beautifully made. I wasn’t sure what I expected, but I liked the hell out of this. Why to watch Up in the Air: This is how you end a movie. Why not to watch: The characters are a bit on the extreme side. I really liked this one, precisely because it was Clooney's atypical character as the protagonist and not Kendrick's more traditional one. I generally find her bland to begin with and her character here did nothing to change that. Having her as the main character would render it all too familiar. 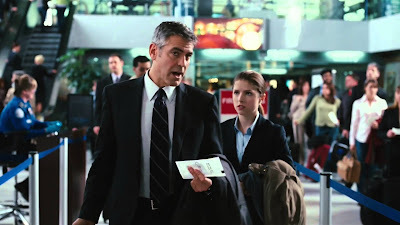 Focusing on Clooney's character gives it bite and, for me, he is really the emotional heart because his character goes through an arc that runs counter to his oft-stated philosophy. When we get to the pivotal moment at the end, it's his feelings that resonate, not Kendrick's. I said all that to say, I liked it a lot, just for different reasons. I get that, and in terms of who the movie should be about, I agree. Kendrick's character is the tradition, and I think we need her here as the contrast. Clooney's character is far more interesting. This movie has over time made a lot more of an impact on me than it did when I first watched it. I liked it a lot, for many of the same reasons you mention above and the surprise near the end is sublime. However I often get to think of the movie when I travel a lot and this year, having so far ticked in at eleven international trips, has been such a period. I get the aloof feeling Bingham has of being everywhere and nowhere, generic hotel room, generic airports, all the small tricks that makes travelling life easier. Thinking of Bingham is a constant reminder to stay rooted with something and someone, rather than just drift like he does. Also the callous attitude to firing people is something I often get to think about. Here in Israel where I live it is even more pronounced than in the movie, except that they are not afraid of telling people to their face, but the callousnes is the same. This is a different movie, one you do not see everyday, and I think they got a lot of things right. That attitude, as callous as it is, is almost refreshing since it is so unusual in movies but so common in real life. I'm writing this response from a hotel room in Minneapolis. I don't have to travel for work that often (I don't even have to leave my house more than twice a week, and twice a week is rare), so for me, hotels and work travel are more an unpleasant novelty than anything else. I'm the opposite of Ryan Bingham--being on the road is completely alien to me and out of my routine. I did have to travel for work frequently a couple of decades ago, and it still never felt normal to me. I'm not good in hotels or on the road. I hope you are having a good stay in Minneapolis. I hear it is a nice place. Our office in the US is in Grand Forks and the staff there always go through Minneapolis. In October I stayed with my family at a wonderful Hyatt hotel in Huahin, Thailand. That is difficult to mind. Too bad most hotels are not like that. Well...it is what it is. I'm away from home until some time on Sunday. Minneapolis is a fine city, but honestly I'm not seeing much but my hotel room and a board room.